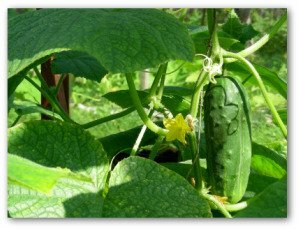 Learn how to grow cucumbers, with tips for growing cucumbers from seeds or transplants in your vegetable garden! 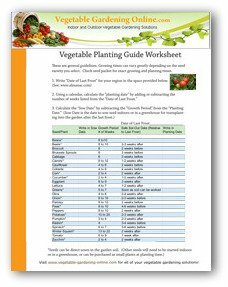 Download our free vegetable garden plans for growing cucumbers, also our zone chart, and planting guide to determine when to best plant cukes. Although the growing cucumber plants can take up a lot of vegetable gardening space, it is worth planting cucumbers because the vining vegetable grown in the garden is far superior to the tough-skinned cucumbers sold at the grocery store! Since cucumbers shipped to supermarkets have often been wax-coated and probably sprayed with chemicals, it is a more than fair trade off to give up some growing room in exchange for for fresh taste! When planting cucumbers, two or three cucumber plants is plenty to satisfy an average size family. Space can maximized by training cucumber vines upwards rather than outward using a cucumber trellis. Avoid using chicken wire because it can burn the tendrils in extremely hot temperatures. It is best to use string stretched between two posts, a wire cage, or a wooden trellis. The ideal vegetable gardening spot for planting cucumbers is in enriched soil where the plants will receive full sun. 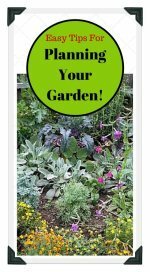 The garden bed should be well-drained but also retain moisture. 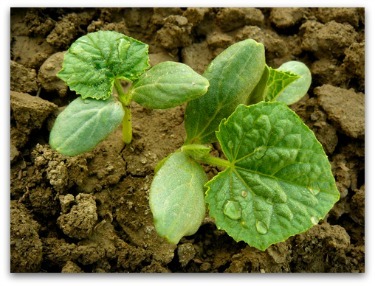 Cucumber plants do not tolerate frost or freezing weather. 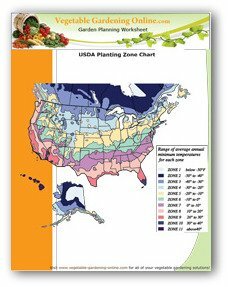 Download our zone chart and planting guide to determine indoor and outdoor planting times for your area. Plant mid to late spring, after weather and soil has warmed. Seed can be sown in peat pots indoors around a month before vegetable gardening is considered safe outdoors due to the end of potential frost warnings for the winter season. Sow cucumber seeds 1 inch deep about 4 inches apart, if vines are to be trained to grow upward. Otherwise, thin plants to about a foot apart, allowing 3 feet between rows. Add organic mulch, hay, or black plastic sheeting to help keep the shallow roots moist. After planting cucumbers in the garden, you may want to give the plants protection in very cold climates where spring arrives late. Gain time can be achieved by setting out the plantings under wax-paper "tents" or other coverings that protect tender plants from frosts. As the conditions outside improve, the covers can be lifted off the bed. Any variety cucumber can be pickled. However, if you want to know how to grow cucumbers specifically to make pickles, there are select varieties recommended. 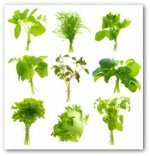 Both of the types mentioned grow compact enough to permit the vegetables to be grown in the smallest vegetable gardening space, including tubs and boxes. For best results when growing cucumbers, give them plenty of water. Cucumbers require more water than many garden vegetable plants. Lack of water can cause cucumbers to be small and bitter-tasting. So pour on the water while your plants are producing! 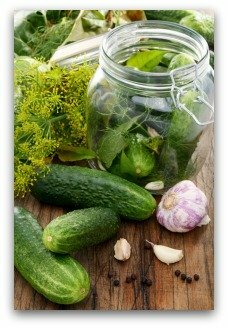 • For making tiny sour French pickles called cornichons, pick the cucumbers when they are only 1 ½ inches long. 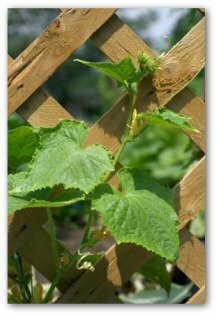 • Most cucumber seed available today is remarkably resistant to any problems. 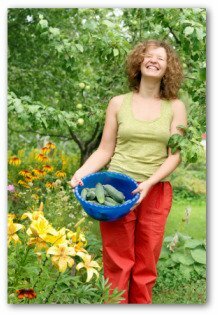 • The biggest obstacle gardeners face in planting cucumbers is leaving the fruit on the vine too long! After planting cucumbers, the veggie hits the ground running, and harvesting can usually begin in 48 to 65 days! When fruits are ripe (oversized, yellowish, orange, or bloated) you have waited too late for harvest! Pick the vegetables before their ultimate size is reached, when the skin is bright green and the spines are just beginning to soften. I am sure you have noticed before the blossom end on a cucumber from the grocer that shows a large white patch. This is a sign that the cuke is mature. Cucumbers should be harvested before the aforementioned signs appear! Harvest often to prevent large fruits from dragging down vines trained to a fence or other support. In warm, sunny weather, the vegetables grow rapidly. Check vines for overripe fruits daily to aid further fruit production.